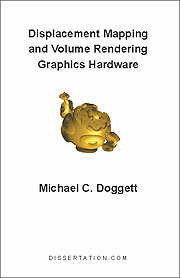 This dissertation introduces new hardware architectures for more realistic surface rendering of three dimensional objects and the rendering of volumetric datasets. Surface rendering is dealt with in the first part of the dissertation where the architectures for displacement map rendering in hardware are proposed. This work represents the first to appear in scientific literature on displacement map hardware rendering. Where possible these architectures propose components that integrate into currently available pipelines and make use of existing units in those pipelines. Displacement map rendering in hardware is a desired feature currently under development by most graphics hardware vendors. The first architecture is scan-line based and works just before rasterization and the second adaptively retessellates a triangle mesh using additional hardware on either side of the geometry transformation stage in the graphics pipeline. The VIZARDII architecture and several hardware based performance improvements for any ray casting architecture are presented in the second part titled Volume Rendering. VIZARDII is an interactve programmable hardware acelerator for Volume Rendering implemented on a PCI Card. The main pipeline is implemented on a Xilinx FPGA allowing new features to be added relatively quickly. A memory interface is presented and discussed with its final implementation appearing in the VIZARDII system. Novel architectures for ray queuing and sorting, sub-cube based space leaping are also presented which improve the performance of ray casting based hardware architectures. Antialiasing that occurs when ray casting volume data is also discussed and possible solutions are presented using multiresolution volume datasets.